Review: Borderlands Review - Page 2 of 2 - This Is My Joystick! Several upgrades can be acquired as you play These include upgrading the amount of ammo that you can carry, grenade upgrades, class upgrades giving you better character bonuses, special ability upgrades adding a status effect to the ability, and finally you can upgrade the amount of weapons you can carry by helping the ‘claptraps’ (little robots) around the world. Whether buying weapons, ammo, shields, health, or upgrades, you will do so from one of the aforementioned vending machines scattered about the levels, normally at the beginning of an area or in a main town (think Bioshock). Sometimes it’s a bit easier if you travel around the world by getting a vehicle. Anyone that has played Halo will automatically be familiar with the driving controls. 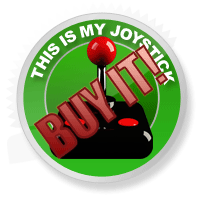 It isn’t a major part of the game and about the only changeable variable is the colour and the attached weapon. In single player you can control the turret/rocket launcher from the driving position or in co-op one of you can get in the turret and operate it while the other person drives. The only real issue I have with the gameplay is the enemy A.I. that seems like it only knows one way to fight you. This would be to gang up on you and hope you die. It seems to be the same tactic over and over, with some of the enemies hanging back and others rushing in. The only real change is what weapon the enemy attacks you with. Generally if they drop the weapon after expiring, it tends to be not that high in level, yet they seem to be able to inflict more damage to you than you can to them if you were holding the same weapon. Occasionally though they do drop weapons that are far more powerful than the ones you have, but the bulk of these are found in the weapons crates. I’m BATMAN! Oh wrong game! 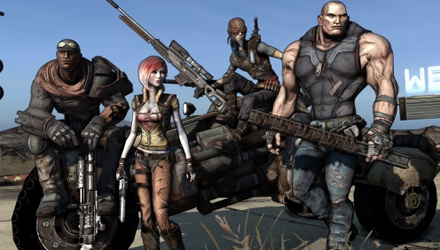 The graphical style of the game is a type of cell-shading labelled as ‘concept art style’ by Gearbox. Although it seems a very simplistic effect it’s actually helped create an extremely detailed world. The comic-book style is in everything from the characters to the scenery, and is all very detailed and very high resolution. It gives a very strange feel, with everything looking like its been rough drawn. This is far different from the original style of the game, but adds something different and makes the game unique in a world of grey’s and browns. Each weapon looks conceivable and you can instantly tell what different parts are included in your latest acquisition. Explosions look spectacular and maintain that comic book feel to them, this also makes you want to blow stuff up if just to admire them. Watching an enemy explode is awesome and you can shoot off different appendages spilling some well deserved blood. The only thing in the world that doesn’t look like it’s straight out of a comic are the water effects; it looks real. The only criticism is that, that’s all it does, there is no mechanic with ripples if you walk through the water and it always looks still. BRICK... Where did you get a 2X4 from? I want one! I can hear your gun, but where the hell are you?! If you have any preconceptions about how Borderlands is supposed to sound you will find that you will be pretty spot on. Each weapon (depending on the components) has its own individual sound. You’ll hear the bullets hit the dirt and whiz past your head and the only thing sounding more realistic than an explosion than in the game is an actual explosion. Atmosphere is well created with a mixture of rising ambient and techno music playing in the background. The game has a pretty decent soundtrack, with a high point for me being the opening track ‘Ain’t no rest for the wicked’ by Cage the Elephant. There is some decent, if under-used, voice talent in the game which makes the characters some much needed personality. There is nothing more satisfying for your character to give out a sick, twisted, and evil sounding laugh as he/she blows something/someone to bits. Can I borrow you for a minute? I’m stuck! There are two parts to the multiplayer. The first would be the co-op (online or local) which uses a ‘drop in-drop out’ system. If at any point in your game you are having some trouble and need a bit of help, you can invite your mate (or up to three if you have that many) and they can give you a hand. If they get to the point that they have to go or you no longer need them they can just drop out of your game. While in co-op you all receive experience from each other so if one person kills an enemy you all get the experience from it. The same occurs with money too; if you pick some up the rest get the same as well. If you’re in the game you can also issue challenges to any of your friends by walking up to them and using melee, if they return the melee you start a duel where its you versus the other person. Until you activate the ‘duel’ you can’t inflict any damage to your chosen partner, which means you don’t need to worry about killing the wrong person. The second part of the multiplayer is essentially a game inside the game. In certain areas there is an arena for you all to battle it out in both ‘player vs player’ matches and team battles. 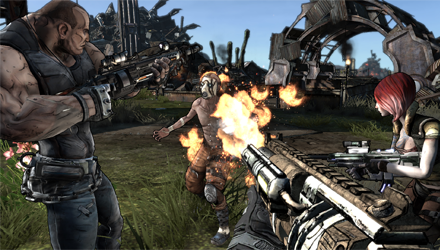 If you take XIII and combine it with Fallout 3, Call of Duty, and the Multiplayer system and intensity of Left 4 Dead you will get something that looks like Borderlands. It’s quite clear from the off that Mad Max is a large influence of the game and combining all the above elements you get a truly spectacular game. All of the game modes have been brilliantly designed, and the extremely well thought-out ‘drop in-drop out’ system works really smartly. Anyone who is a fan of the above mentioned games should automatically enjoy this game, and even if you aren’t then the chances are you will enjoy the game just as much. It can get a little hard in parts but that’s all part of the fun of it and if you press on you will enjoy the intensity of it. The over the top comical violence and dark humour serve to make this a brilliant gaming experience. For some gamers not into loot drops or RPG’s, it might become tedious. If you enjoy the relaxed wandering like you’d find in Fallout and Oblivion, where you really only get enemies in certain areas, then the fast pacing of Borderlands maybe isn’t for you. Gearbox have set a new bar for both gameplay and co-op functionality and it wouldn’t be fair not to commend them for it. When they say that its probably the best game they have made, I have to agree with them. Pushing the boundaries for Western RPG’s in some respects, Borderlands is definitely a clear runner for the game of the year. The usual issues are there but if you look beyond them you find that the world of Pandora is rich and fruitful and a lot of fun can be had.